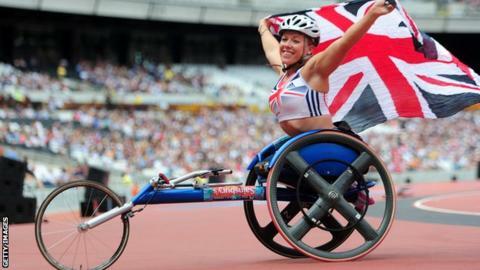 Great Britain's Hannah Cockroft broke her own 200m world record at the IPC Athletics Grand Prix in Switzerland. The multi-world and double Paralympic champion obliterated her 22-month-old T34 time by 0.37 seconds. The 21-year-old clocked 30.86secs to beat a quality field, which included six of the eight London 2012 finalists. "It was great to post such a time in my first Grand Prix of the season. Looking at my training times, I know I can go faster," she said. "This shows I'm in great form ahead of the European Championships in August when, hopefully, I can lower the record again." One of the most anticipated races of the day in Nottwil was the men's 10,000m T54, with GB's Paralympic champion David Weir finishing second to home favourite Marcel Hug.